The Infancy Gospel of Thomas (not to be confused with the Gospel of Thomas; apparently there were a limited number of names in the Levant) depicts 5-year-old Jesus as a little temper-tantrum-throwing tyrant. I’m talking way beyond mischief: the word “demonic” springs to mind. A neighbor messed up the brook that he was supernaturally playing in, so Jesus cursed him; “thou shalt be withered like a tree, and shalt not bear leaves, neither root, nor fruit. And straightway that lad withered up wholly” (III.2-3). Another boy bumps into him, and Jesus straight up killed the kid (IV.1). When that boy’s parents got mad at Jesus for, you know, murdering their child, he cursed them with blindness (V.1). Joseph tried to discipline him with some righteous ear-twisting, and Jesus said, “Vex me not” (V.3). Parents, keep your kids away from this gospel: they might get ideas. Now let those bear fruit that were barren, and let them see that were blind in heart. I am come from above that I may curse them, and call them to the things that are above, even as he commanded which hath sent me for your sakes. And when the young child ceased speaking, immediately all they were made whole which had come under his curse. And no man after that durst provoke him, lest he should curse him, and he should be maimed. You know that moment in Harry Potter and the Deathly Hallows when Harry realizes, too late, that Severus Snape had been on the side of good all along? That eminently hateable villain was just doing what Dumbledore asked, and all he got was a bad reputation. Poor guy. The Gospel of Judas is pretty much just like Deathly Hallows, except Dumbledore is Jesus, Snape is Judas, and we’re all Harry Potter. After two millennia of people using “Judas” as a synonym for traitor, this gospel tells us the poor man was just doing his job. There are a lot of missing chunks, but it looks like Jesus and Judas—working together—plan the details of Judas’ betrayal and Jesus’ crucifixion. Jesus needed his physical body to die in order to ascend to heaven, and he asked Judas to help him out. This is drastically different from Jesus letting Judas betray him. Canonically, Jesus knew what was coming—“Verily I say unto you, that one of you will betray me”—and didn’t stop it, but that doesn’t mean he was happy about it. In fact, he said pretty clearly that “it had been good for that man if he had not been born,” which ain’t exactly friendly. (Matthew 26:21-24). But as the Judas Gospel shows, not everybody was happy with that version of the story... Even in the 2nd century BC, some folks were still in love with Judas, baby. 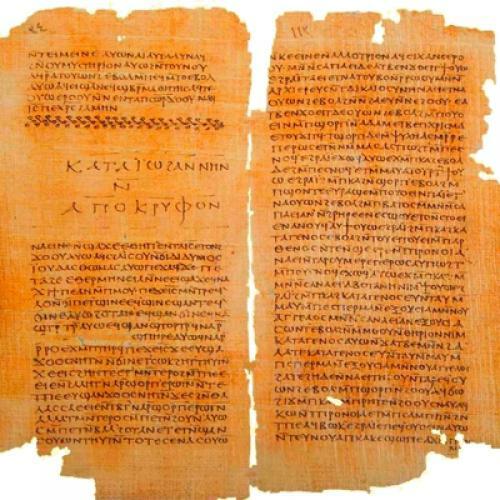 The Philip Gospel, part of the Nag Hammadi codex, is most famous for the section that says “And the companion of the savior is Mary Magdalene. The savior loved her more than all the disciples and used to kiss her often on her [word missing]” which, as you can imagine, has led to some truly delightful academic Mad Libs. Some said, “Mary conceived by the Holy Spirit.” They are in error. They do not know what they are saying. Whenever has a female been impregnated by a female? Mary is the virgin whom no power has defiled... Whoever of the powers (attempts to) defile this virgin, such powers are merely defiling themselves. And the Lord would not have said “My Father who is in Heaven”, unless he had had another father, but he would have said simply “My father”. To recap: Mary was always virgin, indefilable, and so was not impregnated by the Spirit—not to mention that the Holy Spirit is female, and a lesbian divine impregnation is just not believable. Instead, Jesus has two fathers, one in Heaven and one not-in-Heaven, and presumably the not-in-Heaven one is the inseminator, but despite having two fathers, Jesus’ mother was still a virgin. Glad we cleared that one up. As the Smithsonian article takes care to point out, these non-canonical texts aren’t biographical evidence; the new document does not prove that Jesus was married any more than the gospels of Thomas, Judas, or Philip prove that Jesus was a terrible five-year-old, Judas was a secret Snape, or that the virgin birth was... whatever Philip is trying to say it was. Instead, all the non-canonical texts stand as evidence of the diversity of early Christian thought, showing (sometimes colorfully) that before Church orthodoxy was established, early Christian beliefs varied widely. There was no “canon” to defy when these non-canonical texts were written: while churches today call them heresies, to the gospel-writers who recorded them, these Christian texts were God’s own truth.